“Sons of Anarchy” is a great show, because it doesn’t try to portray the MC world as it truly exists, but, as Paris Barclay and Kurt Sutter say, a “great comic book.” A character on “Vikings” has it right when he says “Everything begins with stories,” and the mythology of “Sons” has power that extends beyond the world of bikers. There’s so much story told underneath and in between the narrative, and that is what is powerful, not all the speed and guns. For instance, two or three times in this final season, we’ve seen the guys in the garage working on restoring JT’s 1946 Harley-Davidson Knucklehead, the bike John was killed on, that the bike not just be the unfired rifle hanging above the fireplace mantle that Checkov references. 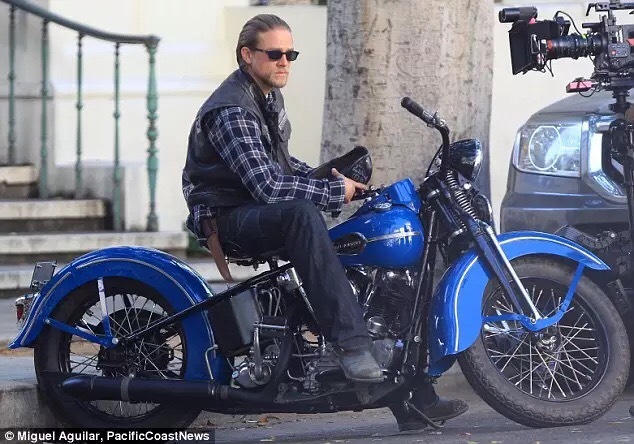 I believe the SOA mythology will wrap with Jax dying on that bike. Jax’s riding a big bagger Road King this season isn’t just about his needing a replacement bike after his parked Dyna Wide Glide was run over by that pimp from early in the season. He’s become the leader he was destined to become, and the Road KING helps reveal that. Riding a bike with bags also, I think, represents the additional *baggage* he’s accumulated since taking the gavel. It’s not just for the convenience of having saddlebags in which to hide the gun he needed to kill Damen Pope in the Season 5 finale. Unto his last, Jax’s stepfather Clay, who was responsible for JT’s death, always rode a Dyna. He was never the legitimate King of SAMCRO. Jax is, and that has changed him. I believe it will ultimately kill him. Gemma was always grateful that “the family flaw,” a heart defect that she survived, but killed Jax’s younger brother Thomas, didn’t manifest in her oldest son. What she has realized, over the past seven season of “Sons,” though, is that a darker flaw, passed down from JT to his firstborn, an existential question shared with Shakespeare’s Hamlet, did, and it’s one that if not answered correctly, will be Jax’s undoing. JT let the flaw overcome him and drive him to despair and the loss of his will to fight for his life. Jax took the opposite road, attacking the question head-on, determined to overpower it. The correct response lies in the middle of these two choices, and it’s one that the audience hopes Able will discover. Fix the problems you can, while not letting those things you can’t control destroy you. Like “The Shield” before it, a show Kurt Sutter wrote for, “Sons” is a masterclass in telling a story on television, and as a writer, I’ve learned a lot from it. I hope to work with KS someday. Update: ***Spoiler*** Looks like I was right, though I admit that when I wrote this, I had no preminition that *The Shield’s* Michael Chiklis would play a part. I also realized, in posting this update, that Jax hadn’t replaced his Dyna Super Glide with a Road King, but a Harley Road Glide. Sorry about that. The TV and Movie business is changing, and it’s for the better. Netflix started the ball rolling for real with its excellent original production of House of Cards, and we’re seeing some great television being launched without the benefit of the networks. Much like when Oz, the gritty prison drama, premiered on HBO, and introduced us to shows not constrained by Broadcast Television’s language, violence and content rules, once we got a taste of disintermediation, where the producers of programming had a little more direct access to the consumers of their creative output, we knew we wanted more. A lot more television gets produced than ever airs. Between late January and late March, Hollywood enters “Pilot Season,” where there’s a mad dash of activity on sound stages anywhere television is produced. It’s the busiest time of year for actors who have decent agents, and it’s not uncommon for one to work on several projects. The hope is, one gets picked up by a network and becomes successful. A few attract enough good attention that they get a shot, and every so often, one becomes a Cheers, Seinfeld or 30 Rock. Usually though, they become a Roll Out, the decidedly unfunny sitcom that tried to cash in on the success of MASH* in a show about race relations among American troops in World War II. Didn’t work. Twelve painfully boring episodes were produced and aired before the whole project was quietly thrown into the trash. Don’t ask me how I remember it. Believe me, the thought that I’m using brain cells to retain all this disturbs me greatly. Regardless of the show’s failure, there was apparently a pilot that led people to believe the show would make it. I’d hate to see the shows that Roll Out beat to make a spot in its network’s lineup. The point is, a lot of pilots get made. A very few get picked up. The vast majority are never seen by the public. The pilot is produced, and made available to Amazon Prime Video subscribers. Amazon customers can watch it, and based on the success of the show, Amazon either picks it up as a regular series or not. It’s putting the decision of whether a show becomes a thing or not a little closer to the people who truly matter, the audience. It’s not perfect, since Amazon Prime Video customers don’t necessarily reflect the tastes of the video-watching public, but it’s a hell of a lot closer to reality than some group of Hollywood TV industry guys deciding what you and I get to watch. Amazon’s most recent Pilot is excellent. Really. Hand of God tells the story of a judge, (Sons of Anarchy’s Ron Perlman) who loses it after his son attempts (and mostly succeeds in) suicide. The first scene shows a police officer, played by Emilio Rivera (Sons of Anarchy, Gang Related, and one of the Priceline commercials where William Shatner plays a long grey bearded biker – Emilio’s one line is “Hey, those guys ain’t no Dragons,” which he wisely delivers with a bandana worn to almost cover his eyes – you have to be an Emilio fan to recognize him, which I am), who wades into a big fountain to coax Perlman’s character out. The judge has shed all his clothes, and is in the fountain speaking in tongues. Obviously, this is a problem, not just for the judge, but also for his wife, played by the magnificent Dana Delaney (Desperate Housewives, Body of Proof, China Beach, and his business partner/Mayor, played by Andre Royo (The Wire). Judge Harris is obviously unbalanced, and claims to be in communication with God. In his court, he finds an acolyte to command and inspire, a heavenly henchman, if you will, in KD, played by Garret Dillahunt (Life, Burn Notice, 12 Years a Slave). Dillahunt is perfect. My exposure to him to date has been as recurring characters in the excellent ABC series, starring Damen Lewis, Life, and the successful USA Network spy series that ended a great run last year, Burn Notice. In both cases, Dillahunt played complete psychopaths, and he does it well. Perfect for KD in Hand of God. Perlman as the damaged Judge Harris is wonderful. As big and bold and unique as he is as an actor, the subtlety with which he brings his characters to life is really incredible. As satisfying as it was seeing Clay Morrow die last season in Sons of Anarchy, I have to admit, the show feels Perlman’s absence. I’d like to think Sons show-runner Kurt Sutter intended that, but as good as KS is, I’m not sure it’s as simple as that. 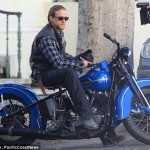 Sutter has admitted the audience’s reaction to the loss of Jax’s best friend, “Opie,” in the previous season was a surprise, and if it was in his plan to eliminate an evil character, but then have an even darker, denser evil rush in to fill that void, then my outlaw-black half-helmet is off to him. Well played, indeed, sir. I am shocked at how much I miss Perlman on Sons. The point is, when you have an actor as skilled as Perlman in your cast, you have a brush that can fill entire sections of canvas with paint in seconds, but still highlight the crow’s feet on a face we see from several yards away. I’ve often remarked that Al Pacino is such a great actor, because we can see him play, not only Michael Corleone, the quiet, yet ruthless crime family head but also the sad, passed over wiseguy, Benjamin “Lefty” Ruggiero, without any hint of the other character present in either performance. Pacino is amazing. And so is Perlman, I’ve come to realize. Though some mannerisms are similar, the raised voice of Clay Morrow is the raised voice of Pernell Harris, but they’re different in a way I can’t identify. I don’t expect Judge Harris to walk out of the courthouse and swing his leg over a Harley Dyna-Glide. Even when Perlman hammers down his gavel from the bench, issuing his ruling as KD stands before him as a defendant, it prompted no flashback at all of Clay Morrow gaveling an end to a SAMCRO meeting around the reaper table on Sons of Anarchy. Amazingly, I didn’t even notice the gavel connection until I was writing this. Two different guys, using two different gavels for two completely different purposes. Hand of God is great television. Well-written, cast and shot. It’s absolutely top-notch television. GOD, I hope Amazon decides to pick the show up. The twist at the end, completely unexpected, and game-changing, makes leaving this story untold something that will seriously disappoint me. Watching the most recent film version of H.G. Wells’ The Time Machine tells a much different story about why humans study the world and why we invent. The original book is about a man of science inventing a time machine, and the adventure he has testing and then using the device. The protagonist discovers how to travel in time, creating a machine with spinning wheels and big levers that allows him to go into the future. At first, he relatively slowly advances through time, finally getting to a future Earth that has suffered some sort of apocalypse, or perhaps steady decline, and is populated by a simple people with no technology, living off the land, and trying to survive under the thumb of the underground dwelling “morlocks,” a vicious species who apparently feed on the above-ground living folk. In the late 70s, Malcolm McDowell played H.G. 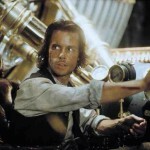 Wells, as a writer/inventor, who travels to the future in pursuit of his friend, who turns out to be Jack the Ripper, who has used the invention to get to modern times. This trip gives “Jack” a brand new hunting ground, where he quickly targets Wells’ new 20th century girlfriend. Rather than use the original title, this movie version is called Time After Time. The most recent telling of the story, starring Guy Pierce (The Hurt Locker, and the excellent Count of Monte Cristo) reverts to H.G. Wells’ title, and the protagonist’s construction of the time machine, but inserts as motivation, the untimely death of his fiancee, the device’s purpose now to change history and restore her to life. He’s depressed over her loss, and seeks to use science to correct the tragedy. More dramatic for today’s audiences? Absolutely. And herein lies the sad truth that discovery for its own sake is no longer that interesting to us. In H.G. Wells day, inventing a machine that allowed the scientist to travel through time was its own reward, the adventure that results a bit of added drama. We’re sadly, no longer thrilled by exploration and scientific advancement, and need a personal stake in the pursuit to make it worth doing. In today’s world, the individual is all that’s important, and something that doesn’t necessarily derive some personal gain, whether it be a huge payday or keeping our girlfriend alive isn’t worth accomplishing. Why can’t Pierce’s character’s development of this amazing step forward in scientific study of our universe be its own reward? I think the filmmakers correctly understood that today’s film-going public wouldn’t care, unless there was something in it for the character they’re being asked to identify with. It’s unfortunate that we’re so self-centered that we have to have more skin in the game than pure scientific advancement to spend our time and money and potentially risk our life on. I understand that in order for a story to be embraced, the audience must want to do what the protagonist does, and am disheartened that not enough of us would believe in the purity of the motivations of a character who didn’t stand to gain something other than discovery in their endeavors. I think that’s one of the reasons we haven’t been back to the moon, or pushing to travel to the stars. When proponents of space travel have to talk about all the everyday products that we wouldn’t have, if not for the space program, we’re on the wrong track. Don’t get me wrong, I wouldn’t want to live in a world without Tang and the Space Pen, but scientific advancement and the opportunity to travel to the stars should be enough to keep going, shouldn’t it?